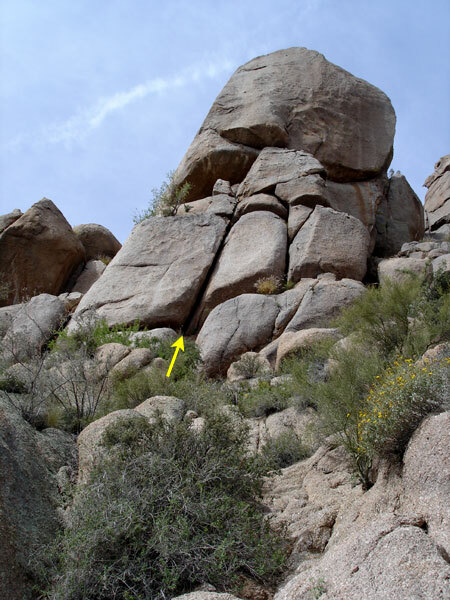 Hades is a nice, clean, wide crack found on the lower east side of the main Pinnacle Peak area. As you hike up to the Peak, it's pretty hard not to notice this slot, although on closer inspection, maybe wise climbers will run away. The route was originally led using tube chocks for protection, and they were pretty much only psychological pro at best. Protection aside, as offwidths go, Hades is probably one of the easier 10b offwidths out there to climb, given there are a few crystals on the right side of the crack that help you out at the most desperate times. Jay Anderson, Offwidth God, even climbed the route onsight and solo back in the day, not that that's any indication of it's difficulty. 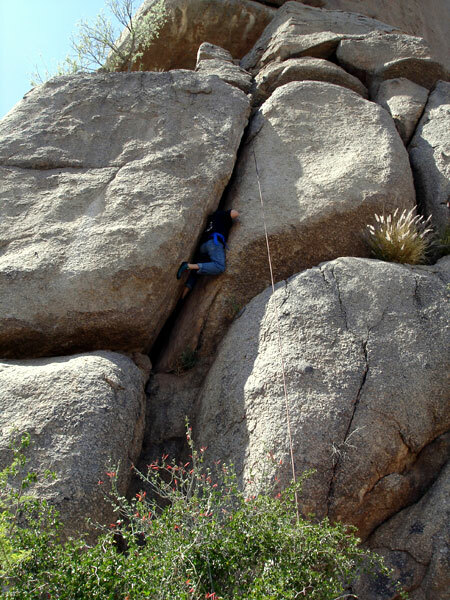 To get to the route, park in the lot at the Pinnacle Peak Park Visitor's Center, just off Alma School Road near where it intersects with Jomax Road in northeast Scottsdale. Hike up the main trail to the climber's trail that heads up to the Peak proper. Follow this trail to the base of Pinnacle Peak. Hades is a wide crack system about 40 feet to the right. The first 15 feet are straight forward and just involve getting up a short slot to the "business" section of the route, the bombay wide slot above. Get into it and don't let up until you reach the top. If you're leading, you'll need a piece or two in the 7" to 9" range. You can place a #4 Camalot at the bottom of the bombay and then a 5" to 6" piece in the finishing few feet of the route. After reaching the ledge at the top, you can place gear for an anchor. 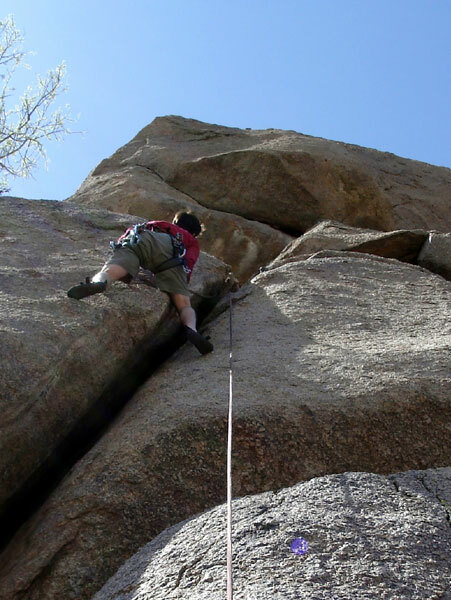 There is also a single, sort-of-hard-to-see bolt over to climber's left at the top. 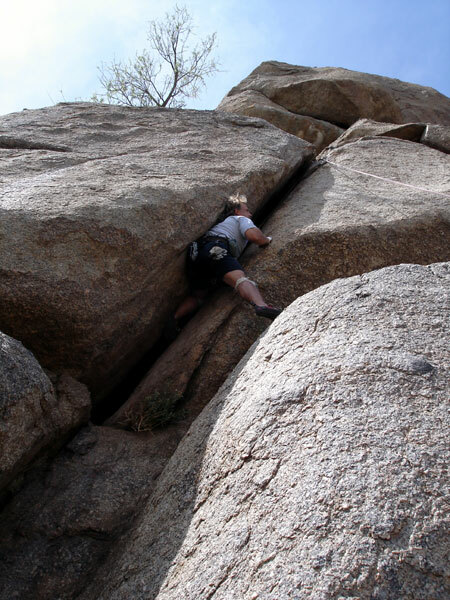 As most climbers will likely not have the pro to lead this one, it is fairly easy to set up a toprope. You can either lead the initial 4th class portion of South Crack route and then traverse to the right and down to the ledge atop the route, or you can lead Name It (5.6) the route just to the right of Hades as a slightly better warmup for the thrashing ahead. I seem to recall using some medium to large cams in addition to the bolt mentioned above to set up the toprope anchor. Armbars, kneebars, ankle rending, and other chicanery will be involved. Bring kneepads and boots (or tape your ankles to protect them).